Goal: add a network printer via Remote Desktop’s command-line to numerous Macs. -E — enables the printer. -o printer-is-shared=false — the added printers are shared by default (i.e. “Share this printer on the network” would be ticked). Since my printer is already shared on the network, I don’t want to share it again from the Macs. NAME — arbitrary name, can be anything, e.g. “MyBadassPrinter”. URL — the printer’s URL. PPD — the path to a .ppd (PostScript Printer Description) file. Probably you don’t know how to find the URL and the PPD of the printer. The first step to retrieve them is to add the printer to your computer via System Preferences > Print & Scan. How to get the PPD? This is easier: go to /etc/cups/ppd/ and copy the PPD file. Obviously you’d want to put it on a local NAS or in some other place that would be accessible by other Macs. 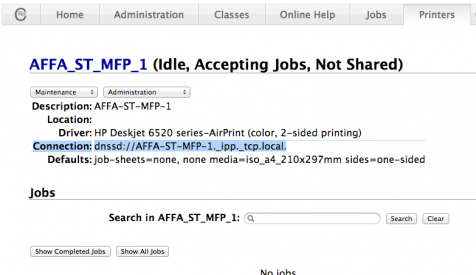 Configure network printers via command-line on Macs by William Smith. How to set up a Mac Printer by the Command Line. This entry was posted in How to’s and tagged mac administration, macos. Bookmark the permalink. This looks good, can the PPD file part be omitted? Our printers do not need PPD. Is it possible to add IPP printer without PPD? When specified before the -d, -p, or -x options, the -E option forces encryption when connecting to the server. Thanks. Although I remember that it worked as I expected it to back in the day. Does anyone know the terminal command to add a printer to a mac that is already being shared on the network? I have an old mini that is sharing printers to everyone. We just replaced these printers with new ones. This mini (Print Server) is now updated and sharing these new printers. I know the terminal command how to erase all the current printers on each of our macs. But can’t figure out how to add these new printers from the Print Server using ARD and the unix command. Something like this???? This is as far as I got but still getting an error…. lpadmin: Unable to open PPD “/Users/it/Desktop/C5550.ppd”: Unable to open PPD file on line 0.